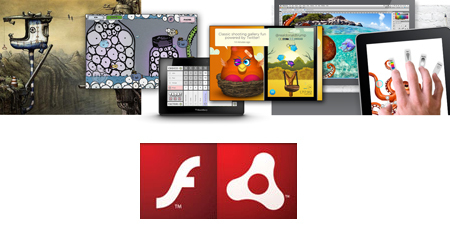 There has been a lot of buzz about how Adobe has “Killed Flash on Mobile”. This is not true. The current Flash plugin is still supported on mobile including security updates so any legacy content on mobile devices will continue to work. Adobe will not be developing future plugin versions on mobile. In general, the mobile browser is for looking at things and mobile apps are for doing things. Flash is great for making apps. HCJ is fine for presentation and animation on the browser. Flash would have been fine as well if you discount legacy pages that were not designed for mobile and of course if all platforms supported it. Flash remains on browsers on desktop and if indeed the plugin architecture fades on desktop, there is AIR for desktop apps which will support Flash. Also, there are experiments in streaming Flash interactive content to browsers without the use of plugins which would be ready I am sure by any demise of desktop/laptop browser plugins. Below is a link to some excellent Flash experiences should you need a more positive reminder of what we can build.